Snow often begins to fall around Christmas season, and Hokkaido is covered with the snow until late March that snow begins to melt, the ground turns into the white world in a winter. 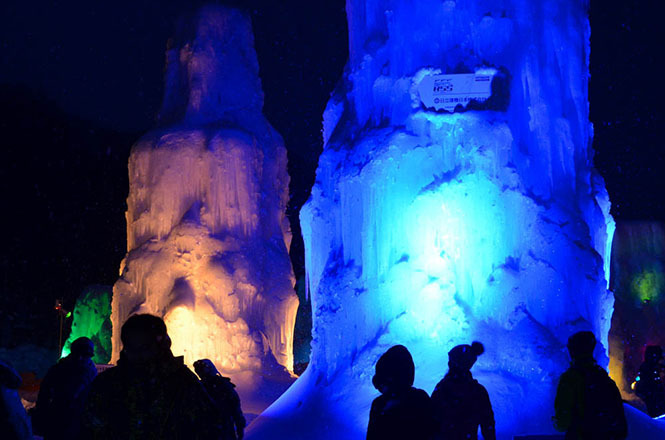 The snow falls in silence, and the temperature falls, too, and its peak is February, and various winter events that snow, ice and coldness can be enjoyed are held all over Hokkaido around the February. 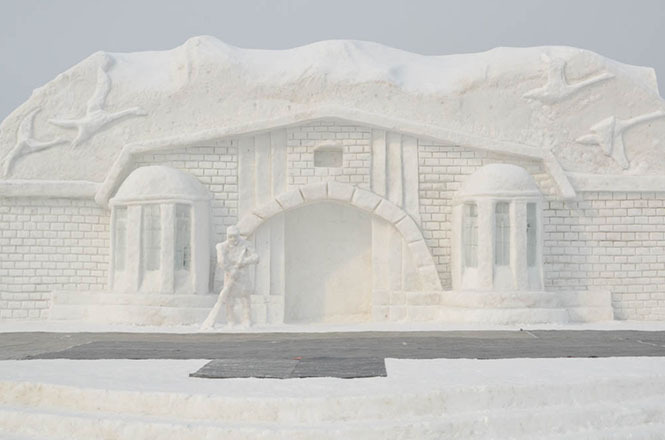 Sapporo Snow Festival (札幌雪まつり) is famous as the largest winter festival in the Hokkaido, and 2 million people from all over the world visit the event. 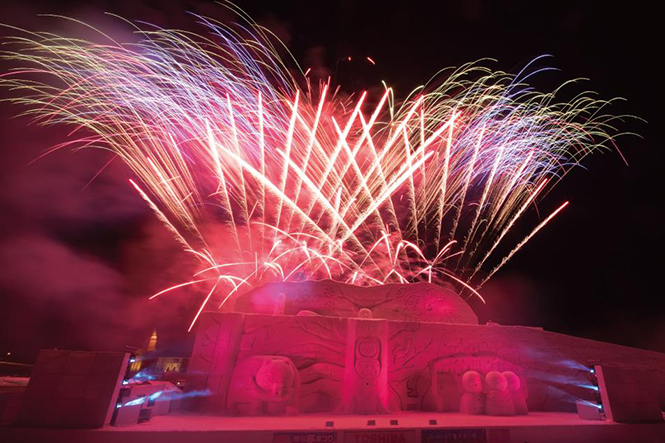 It is said that the worldwide winter event is one of 3 major snow festivals in the world together with Québec Winter Carnival in Canada and Harbin International Ice and Snow Festival in China. 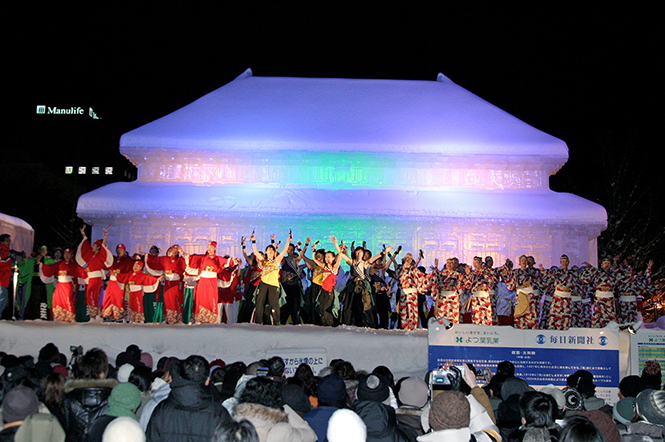 After the Sapporo Snow Festival, Asahikawa Winter Festival (旭川冬まつり) is the second largest winter festival in the Hokkaido, and about 1 million tourists come to see the event. 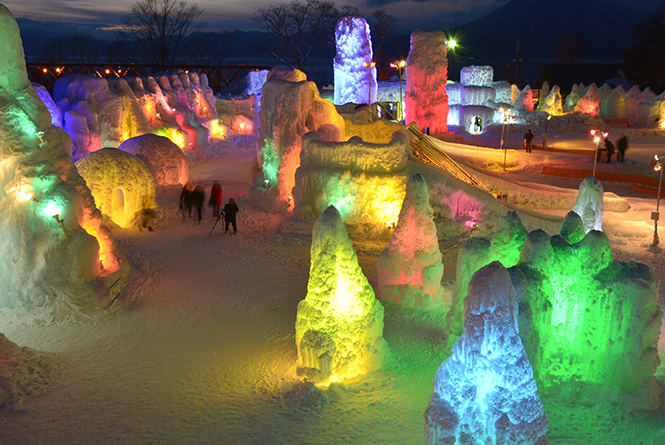 Except the large winter festivals, various winter events using snow or ice are held all over the Hokkaido. 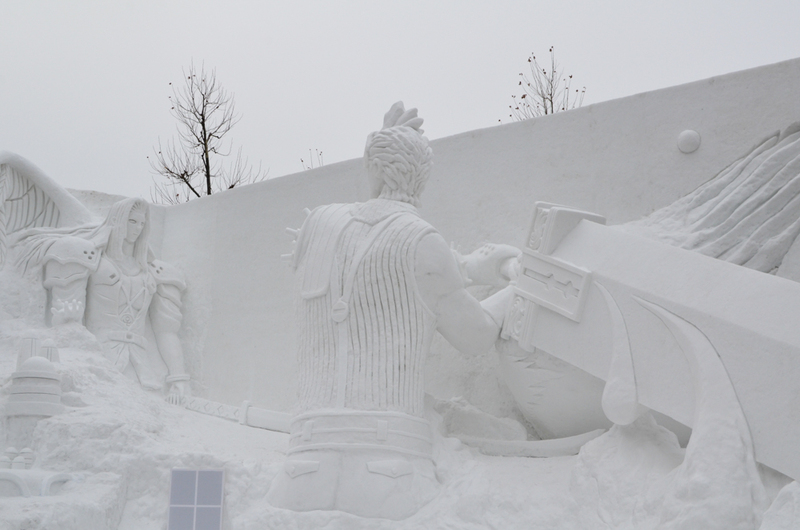 Famous winter events using snow sculptures are Abashiri Okhotsk Ryuhyo Festival (あばしりオホーツク流氷まつり), Nayoro Winter Festival (なよろ雪質日本一フェスティバル), Iwamizawa Heavy Snow Festival (岩見沢ドカ雪まつり) and Kitami Winter Festival (北見冬まつり). 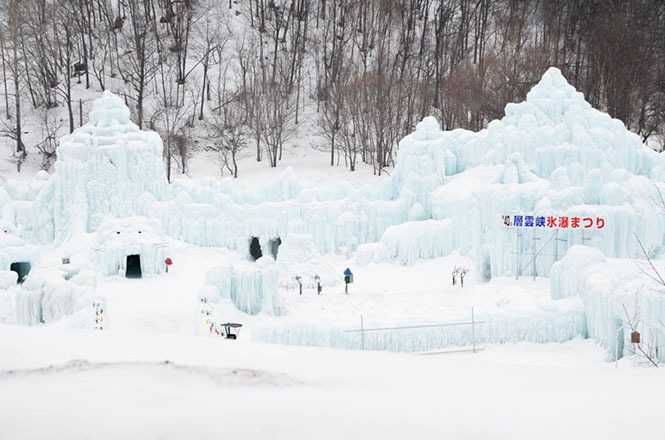 Famous winter events using ice sculptures are Sounkyo Ice Waterfall Festival (層雲峡氷瀑まつり), Chitose Lake Shikotsu Ice Festival (支笏湖氷濤まつり), Shikaribetsu Kotan (然別湖コタン) and Monbetsu Ryuhyo Festival (もんべつ流氷まつり). 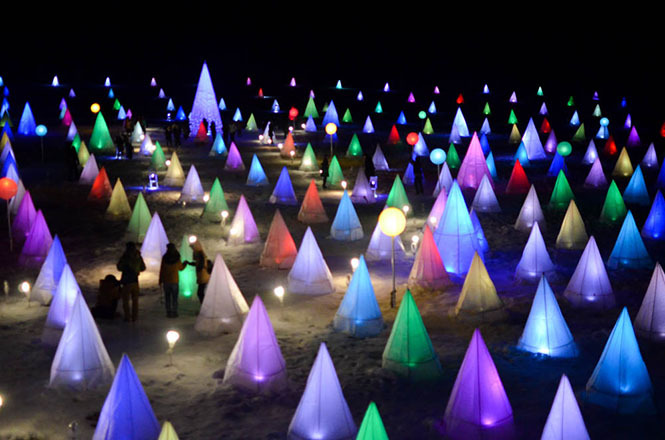 Illumination events or winter events that coldness can be enjoyed are held as well as the winter festivals in the Hokkaido, too. 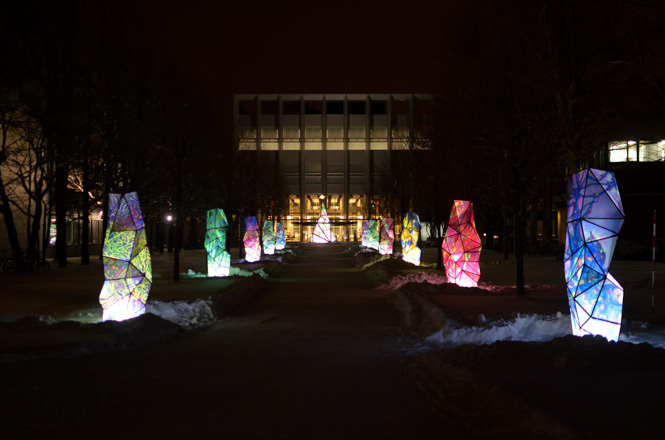 Except famous illumination events, Little-known illumination events are held, too. I was surprisingly moved by those. My visited those in Sapporo are as follows. 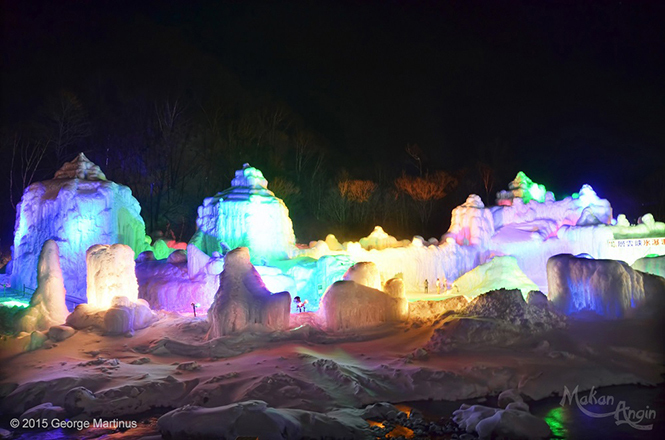 My visited the winter festivals are Sapporo Snow Festival, Asahikawa Winter Festival, Sounkyo Ice Waterfall Festival, Chitose Lake Shikotsu Ice Festival, Otofuke Tokachi Swan Festival Sairinka, Nayoro Winter Festival, Abashiri Okhotsk Ryuhyo Festival, Monbetsu Ryuhyo Festival, Lake Shikaribetsu Kotan and Iwamizawa Heavy Snow Festival. 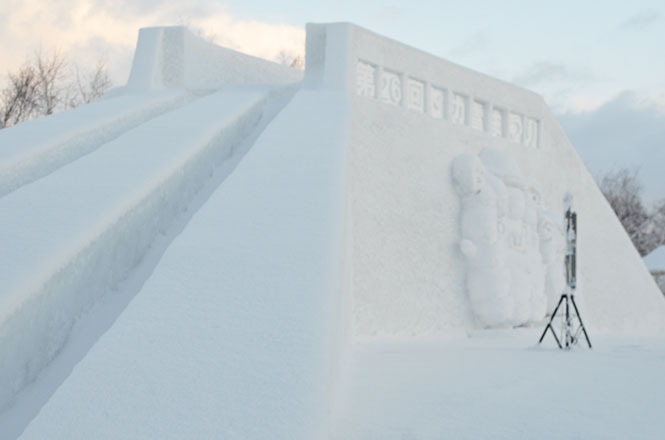 I want to visit other snow events, too. 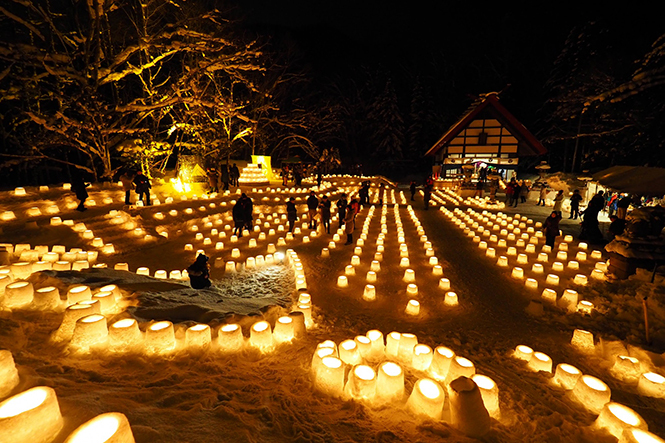 Iwamizawa Heavy Snow Festival is a snow event in late Febuary. 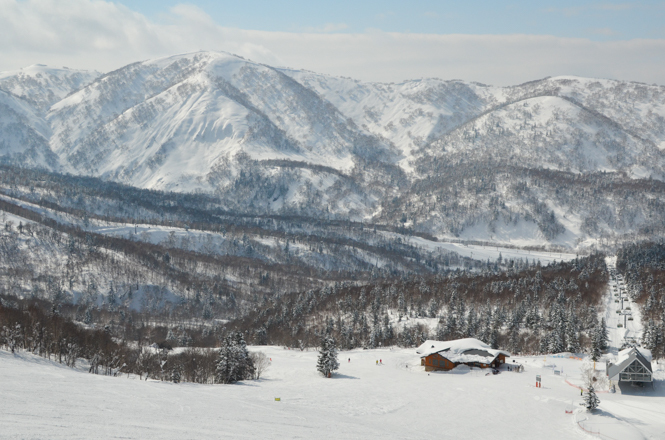 Iwamizawa city is famous for heavy snow, so the event was named after it, and is held beside Iwamizawa Station. 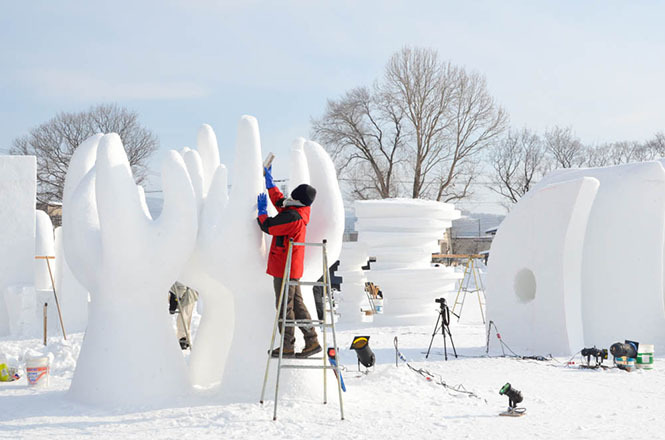 Small and large 6 snow sculptures with ice slides are built. Because the venue is not large, such a characteristic might appear. 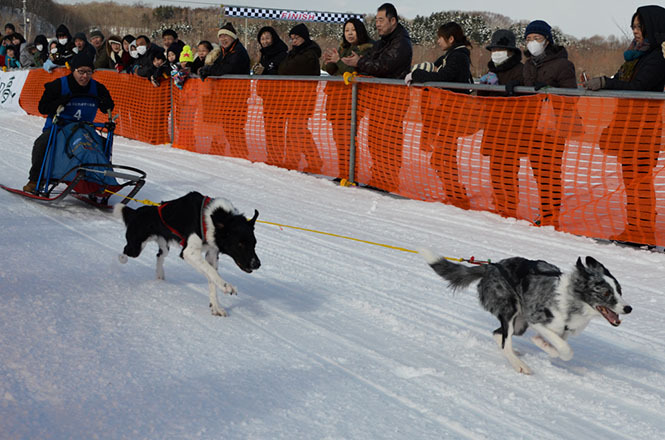 In addition, there is a strange race track like a course of the sled. Except the snow sculptures, a lot of food stalls line, and tourists can eat pheasant dishes, Iwamizawa local specialty dish, too. I did not know that the pheasant dish was the Iwamizawa local specialty dish only after I came here. 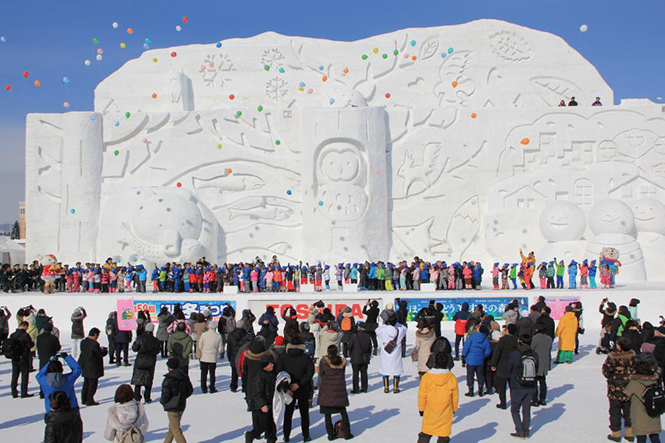 There are few the snow sculptures, but some events such as the ningen bamba race event seems to be carried out. 10:00-19:00 * It changes depending on days. 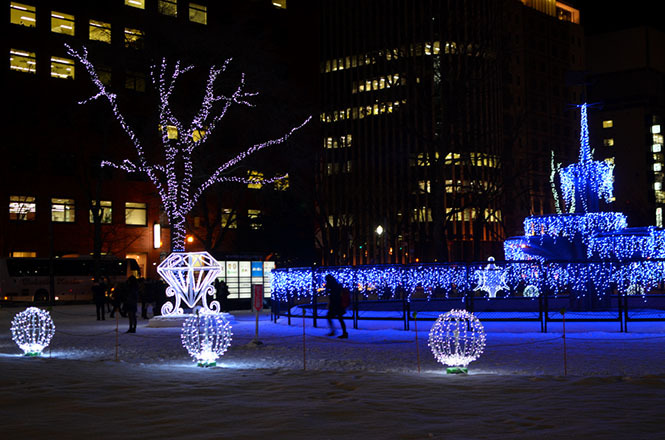 Except famous snow or ice festivals, other illumination events, winter events using ice candles, the winter events that coldness can be enjoyed and sled dog racings are held in various places of the Hokkaido. 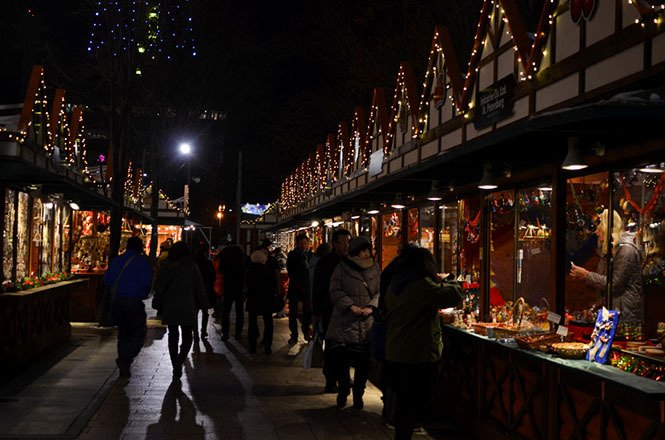 My visited other winter events are Jozankei Yukitoro (定山渓雪灯路), Eniwa Sled Dog Racing (恵庭犬ぞり大会), German Christmas Market (ミュンヘンクリスマス市), Sapporo White Illumination (ホワイトイルミネーション) and Otaru Snow Light Path (小樽雪あかりの路). 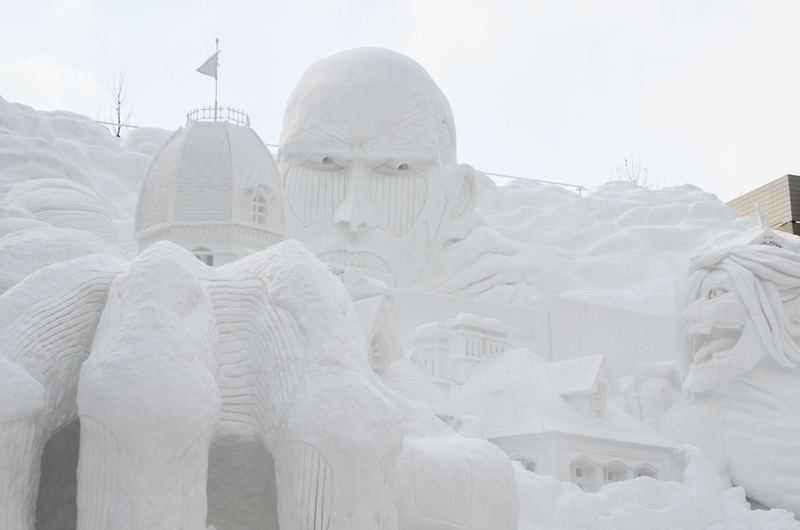 In addition, As far as I searched the winter events in the Hokkaido, those are as follows. Open period is from November to mid February. 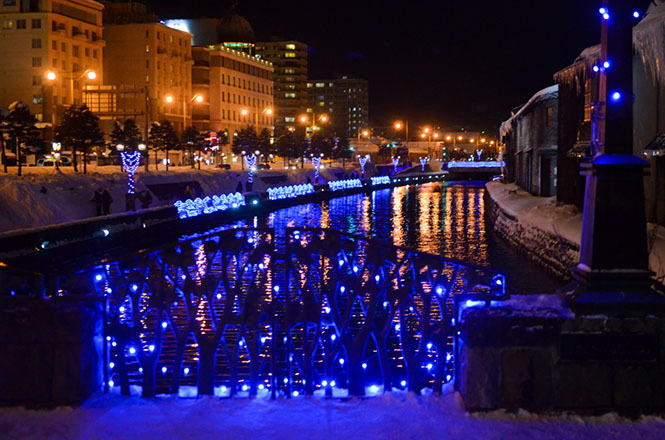 Venues are Otaru and Yoichi. Open period is from November to early March. A venue is Toya. Open period is from late November to late December. A venue is Sapporo. Open period is 1 day in mid December. A venue is Horonobe. 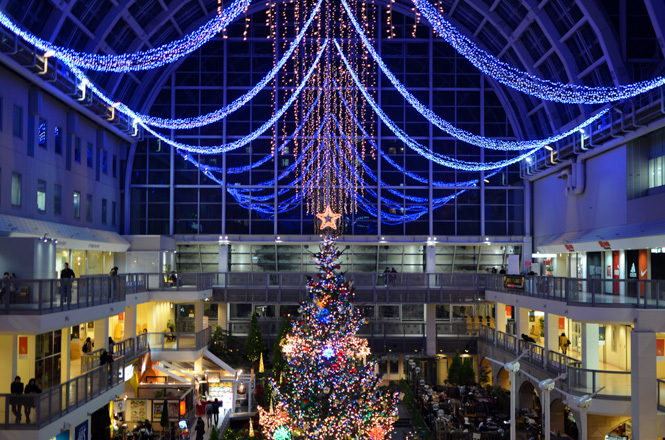 Open period is from 1 December to 25 December. A venue is Hakodate. Open period is from December to February. A venue is Hakodate. Open period is from December to early March. 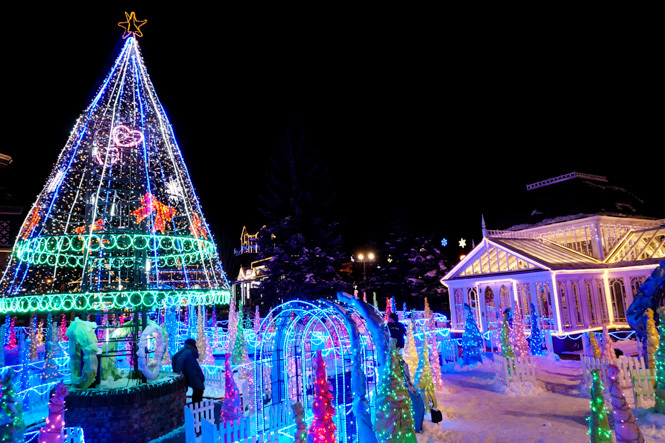 A venue is Asahikawa. Open period is from December to mid March. A venue is Kitami. Open period is from December to late February. A venue is Hakodate. Open period is from mid December to February. A venue is Shintoku. Open period is from mid December to mid March. A venue is Shimukappu. Open day is 14 December. A venue is Sunagawa. Open period is from late December to early March. 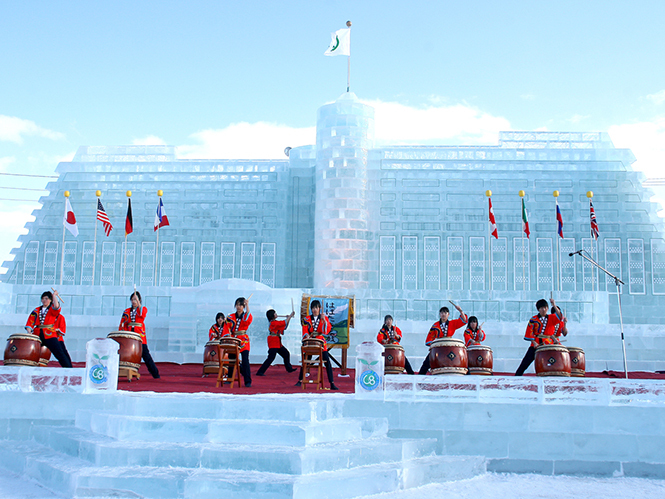 A venue is Furano. Open day is btween 31 December and 1 January. 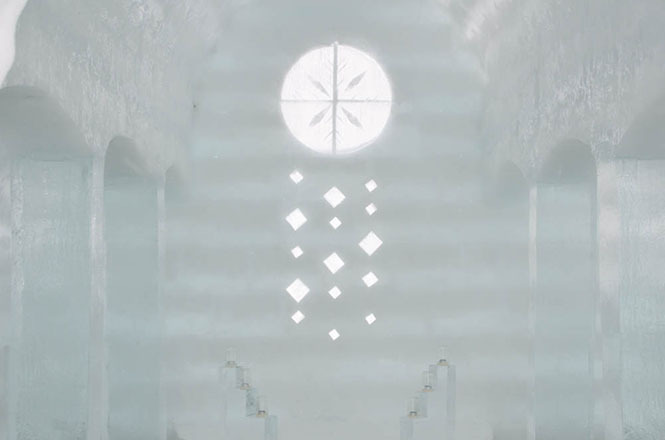 A venue is Kamifurano. Open day is btween 31 December and 1 January. A venue is Niikappu. Open day is 1 January. A venue is Wakkanai. Open day is 1 January. A venue is Nemuro. Open period is 4 days in mid January. A venue is Sapporo. Open period is 2 days in late January. A venue is Higashikawa. Open period is 1 day in late January. A venue is Atsuma. Open period is 1 day in late January. A venue is Nakatonbetsu. Open period is 1 day in late January. A venue is Shintotsukawa. Open period is from late January to mid March. A venue is Kamikawa. Open period is from late January to mid February. A venue is Chitose. Open period is from late January to late March. A venue is Shikaoi. Open period is from late January to late February. A venue is Otofuke. Open period is from late January to early February. A venue is Sapporo. Open period is from late January to late February. A venue is Shari. Open period is from late January to late February. A venue is Monbetsu. Open period is from early February to late February. A venue is Teshikaga. Open period is from February to early March. A venue is Lake Akan. Open period is 1 day in early February. A venue is Naie. Open period is 1 day in early February. A venue is Tsubetsu. Open period is 1 day in early February. A venue is Biratori. Open period is 1 day in early February. A venue is Atsuma. Open period is 1 day in early February. A venue is Ashoro. Open period is 1 day in early February. 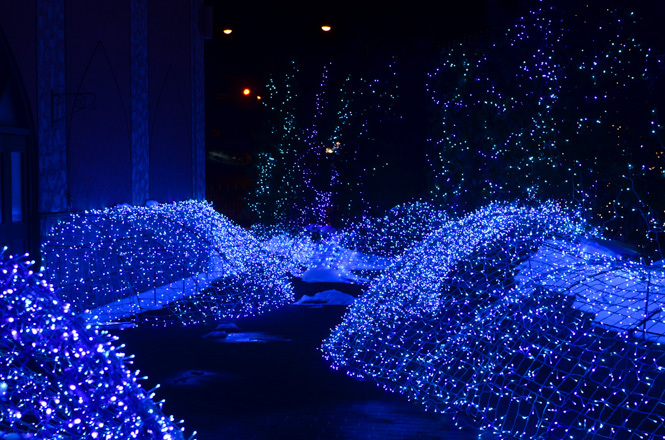 A venue is Shinhidaka. Open period is 1 day in early February. A venue is Nayoro. Open period is 2 days in early February. 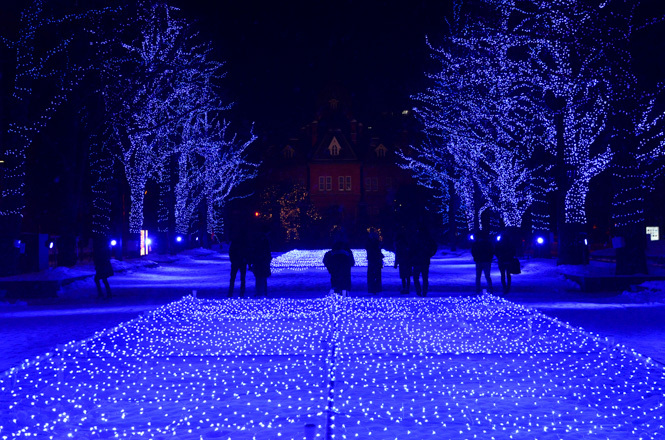 A venue is Furano. Open period is 2 days in early February. A venue is Rikubetsu. Open period is 2 days in early February. A venue is Kushiro. Open period is 2 days in early February. A venue is Esashi. Open period is 2 days in early February. A venue is Nanae. Open period is 2 days in early February. A venue is Shibetsu. Open period is 3 days in early February. A venue is Obihiro. Open period is 3 days in early February. A venue is Fukagawa. Open period is 2 days in early February. A venue is Bibai. Open period is 2 days in early February. A venue is Tomakomai. Open period is 2 days in early February. A venue is Noborubetsu. Open period is 2 days in early February. A venue is Nakashibetsu. Open period is 2 days in early February. A venue is Yakumo. Open period is 2 days in early February. A venue is Kitahiroshima. Open period is 3 days in early February. A venue is Hakodate. Open period is 3 days in early February. A venue is Nayoro. Open period is 4 days in early February. A venue is Monbetsu. Open period is 6 days in early February. 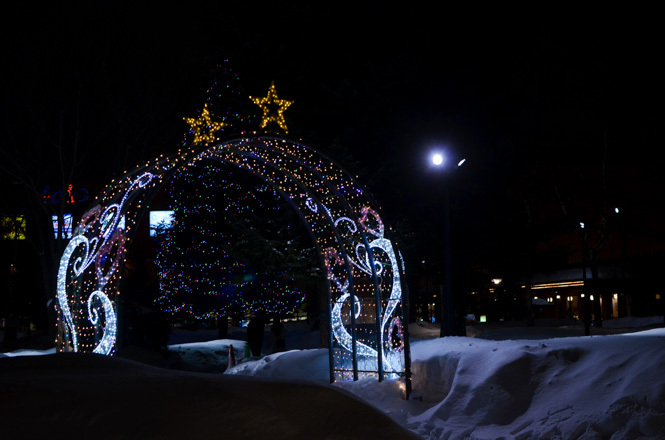 A venue is Asahikawa. Open period is 8 days in early February. A venue is Sapporo. Open period is 10 days in early February. A venue is Toya. Open period is 1 day in mid February. A venue is Takikawa. Open period is 1 day in mid February. A venue is Makubetsu. Open period is 1 day in mid February. A venue is Wassamu. Open period is 2 days in mid February. A venue is Hokuto. Open period is 2 days in mid February. A venue is Takikawa. Open period is 2 days in mid February. A venue is Kuttchan. Open period is 3 days in mid February. A venue is Abashiri. Open period is 3 days in mid February. A venue is Shimokawa. Open period is 10 days in mid February. A venue is Monbetsu. Open period is 10 days in mid February. A venue is Otaru. Open period is 2 days in late February. A venue is Sobetsu. Open period is 2 days in late February. A venue is Wakkanai. Open period is 2 days in late February. A venue is Nakagawa. Open period is 1 day in early March. A venue is Noboribetsu.